With two days in Athens, you have time to branch out beyond the essential museums and archaeological sites to delve deeper into history, treat your tastebuds to some traditional cuisine, and explore the local neighborhoods. Here’s how to make the most of two days in Athens. Morning: Kick off your 48 hours in Athens with a half-day city sightseeing tour. You’ll get an overview of the city’s top attractions, such as the Temple of Zeus, Panathenaic Stadium, Dionysos Theater, and the National Gardens of Greece. Opt for a private tour to customize your itinerary and get insider tips on the best places to visit during your stay. Afternoon: Now that the morning crowds have cleared, head up to Athens’ main landmark, the Acropolis. Spend the afternoon exploring this UNESCO-listed archaeological wonder on your own or with a tour guide who can fill you in on the history of the ruins, including the Parthenon. Continue learning about the Acropolis and its history at the Acropolis Museum. Night: Wind down your day of sightseeing with an evening on the town. Do it like the Greeks do with a leisurely dinner at a traditional taverna; tuck into meze (appetizers) at spots where locals go to socialize, sip ouzo or raki, and dance to the sounds of bouzoukia, a local folk music. Morning: After getting an overview of Athens, today is the day to dig deeper into the rich culinary traditions of Greece with a morning cooking class. Classes typically include learning to prepare traditional dishes using fresh, local ingredients before dining on the fruits of your labor. Alternately, hit the pavement on a walking food tour to sample some of the city’s best bites. Afternoon: Spend your afternoon strolling through one (or more) of Athens’ neighborhoods. Colorful Plaka, the oldest residential district in Athens, is a maze of narrow lanes and alleyways lined with shops and cafes. For bargain shopping and historic ruins, head to Monastiraki in central Athens, or, for people watching, visit Syntagma Square. Night: Treat yourself on your final night in Athens to dinner with a view. Take the funicular to the top of Lycabettus Hill for a meal with panoramic views over the illuminated city below, or book a table in a revolving restaurant 165 feet (50 meters) up for a look at the Acropolis while you eat. Eat dinner in a revolving restaurant suspended in the sky during this thrilling experience in Athens. 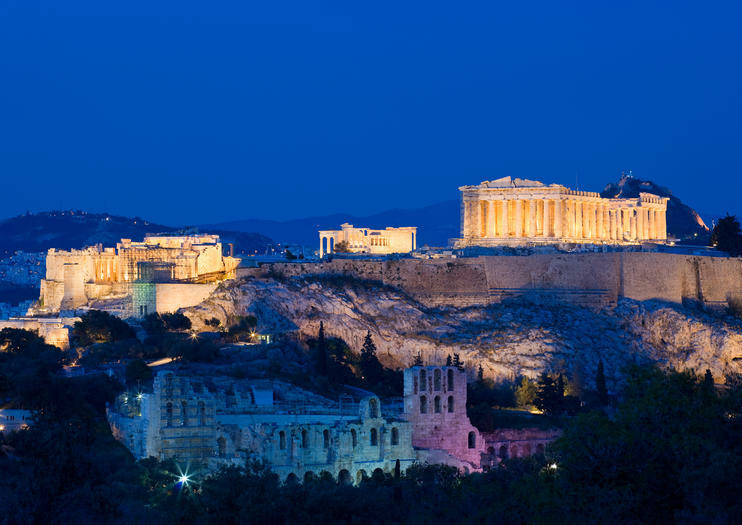 From a bird's eye view at 165 feet (50 meters) in the air, get views of the city of Athens lit up at night, including the illuminated Acropolis, as the table slowly rotates. With 22 dining companions, feast on a 6-course meal of modern and traditional Greek dishes with unlimited wine, beer, and soft drinks. Choose between Sunset Dinner or City Lights Dinner. Take a whirlwind tour of Athens history in a private taxi driven by your guide. You’ll the city’s fascinating historical highlights in just half a day, including the Acropolis, Temple of Zeus, Greek parliament, Panathenaic Stadium, and more. Hear fascinating commentary along the way, choose between a morning or afternoon departure to best fit your schedule, and enjoy convenient hotel pickup and drop-off.